Chief Allan Adam, a persistent critic of the oilsands and pipelines, says Fort McMurray-area First Nations and Métis communities are looking to partner with companies to build a pipeline. First Nations and Métis communities in the Fort McMurray region are expressing interest in becoming business partners in the pipeline industry. The indigenous communities want to either buy a stake in the Trans Mountain pipeline or partner and build another future line. "We want to be owners of a pipeline," Allan Adam, chief of Athabasca Chipewyan First Nation, said in an interview. "We think that a pipeline is a critical component to the oil and gas sector, especially in this region. "If Fort McMurray and Alberta are going to survive, the Athabasca Tribal Council has to be alongside." Adam, a board member with the Athabasca Tribal Council, an umbrella organization that represents the region's five First Nations, admitted, the details still need to be worked out. Ron Quintal, president of the Athabasca River Métis, the organization that represents five Métis communities in the region, confirms it is also on board with the proposal. But Quintal said he expects they would need backers to help guarantee loans to help fund the multi-billion dollar project. The announcement happened on the heels of the groups's meeting with Prime Minister Justin Trudeau in the basement of a Fort McMurray hotel on April 6. Participants say it was the first time the region's Cree, Dene and Métis communities met together with the head of the federal government. Typically, such high level meetings don't take place with everyone at the table. Also in the background is the uncertainty over the fate of the Trans Mountain pipeline expansion which would ship bitumen from Alberta to the B.C. coast. 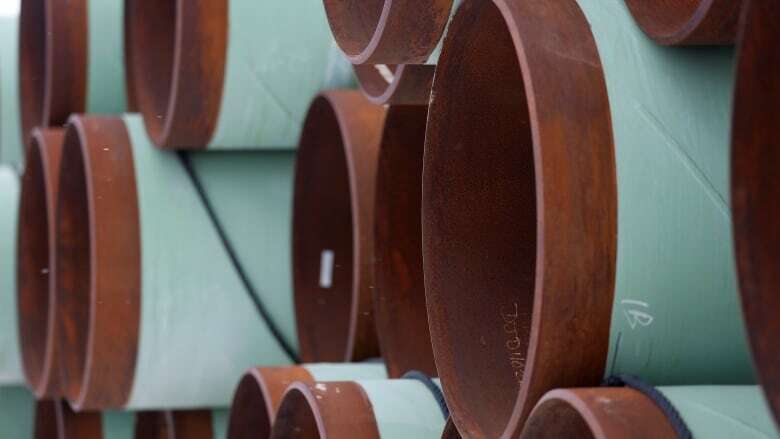 Kinder Morgan announced recently it will halt "non-essential activities" and related spending on the project and set a May 31 deadline to decide whether the project will proceed. The company declined to comment for this story. Premier Rachel Notley said the May deadline is a serious concern, suggesting Alberta may become a co-owner in the pipeline's construction. The announcement from Adam is a change in position for the chief, who is no stranger to pipeline opposition. The chief has posed with celebrities and activists critical of the oilsands' environmental legacy. Most recently, Adam was pictured with Hollywood actress Jane Fonda, who described the oilsands on a 2016 trip to Fort McMurray as if "someone took my skin and peeled it off my body over a very large surface." Adam denied he was ever anti-pipeline or against the oilsands. But the chief said he is critical of the feverish pace for oilsands development without enough environmental considerations. Adam also admitted that fighting oil company and industry expansion has been tough and it is time for a change. "The fact is I am tired. I am tired of fighting. We have accomplished what we have accomplished," Adam said. "Now let's move on and let's start building a pipeline and start moving the oil that's here already." 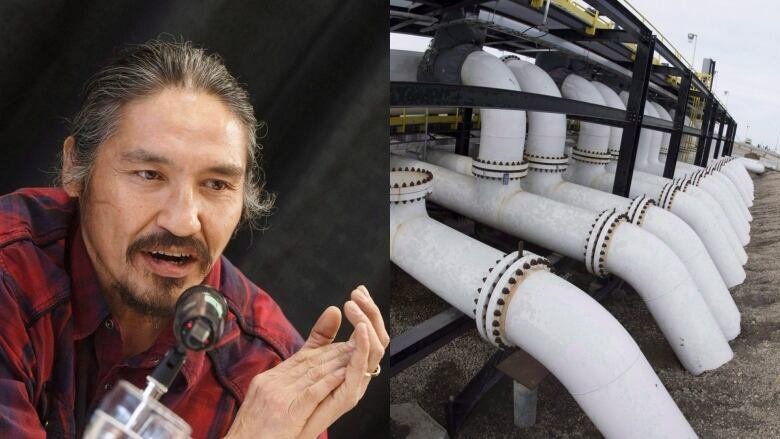 Archie Waquan, chief of the Mikisew Cree First Nation, also supports a pipeline partnership. "No disrespect to the other First Nations that are against the pipeline in B.C.," Waquan said. "From our end — from this northern territory where the oilsands comes from — we would like to see more things happen and hopefully this will go ahead." The region's Métis communities say having pipeline ownership would help alleviate roadblocks oil and gas projects have been facing lately. Quintal said First Nations and Métis involvement would provide ease of access for a pipeline route on their traditional territory. Also, he said, Indigenous owners would take the utmost care to ensure the pipeline route would avoid sacred or sensitive land areas and that infrastructure is maintained to the highest standards to prevent spills. "From our perspective, the Métis have always for the most part been pro-pipeline," Quintal said. "I am not saying that it's an open book or a blank cheque for the industry to develop pipelines. "Ultimately we are the keepers of the land and it is of the utmost importance that lands are protected as much as possible." Quintal said Indigenous owners behind a pipeline might also lend credibility to a project that could quell some opposition.